Brush each sirloin steak lightly with oil. Season with salt and pepper. Preheat the char-grill pan to hot before adding the meat. Remove steaks from heat, loosely cover with foil and rest steaks for 2 minutes before serving. 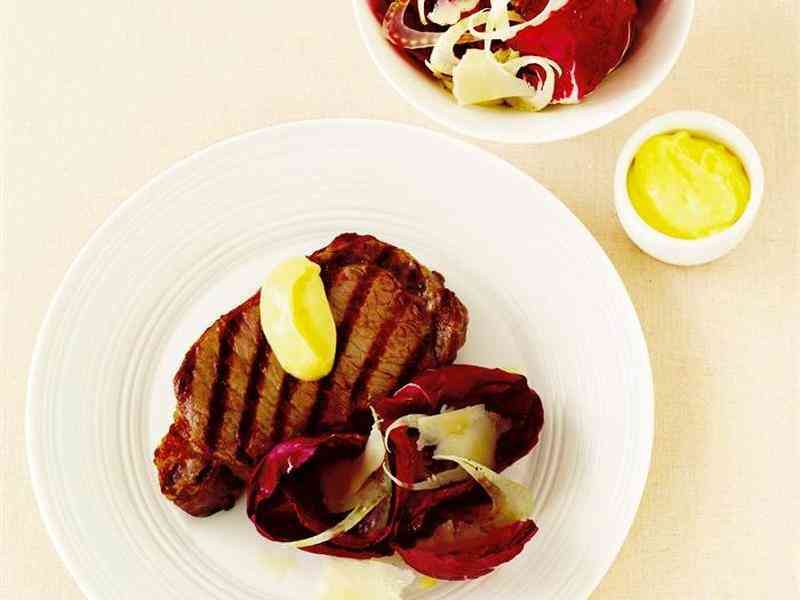 Serve the steaks with aioli and salad. To make aioli: in a food processor process garlic, salt and egg yolks until smooth. Measure the 1½ cups olive oil in a jug. With the motor running begin to add the oil a few drops at a time. As the mixture starts to thicken you can add the oil in a thin stream. Add the lemon juice and a little hot water to make the aioli as thin as you like. To make radicchio salad: wash the radicchio and separate the leaves, place in a salad bowl. Add the fennel, drizzle with a little oil and vinegar, add flaked Parmesan.